This little fungus caused a fair bit of consternation when I was trying to identify it. 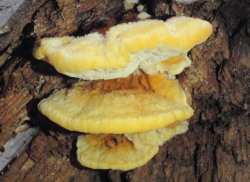 It’s soft and bright yellow when young, then as it dries, it hardens and turns bright orange. I had it pegged as Phaeolus fibrillosus (from Mushrooms Demystified by David Arora), but couldn’t find any images for that one on line. 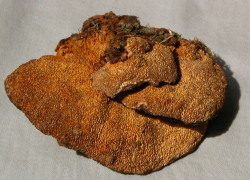 So of course I had to show a dried specimen to David when he stayed with us, and he identified it as Pycnoporellus fulgens . . . formerly known as Phaeolus fibrillosus. 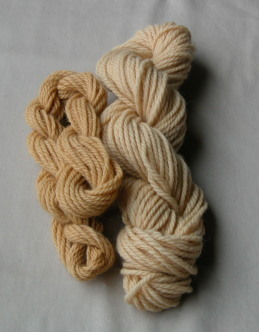 It doesn’t give a strong colour, but the soft peachy hues will act as a lovely neutral with the stronger mushroom colours. I just found your fantastic blog. I’ll be checking in and would really like to try and make it if you have another mushroom fest. I’m in with the weavers and spinners group in Powell River so not too far away.